I LOVE Linda Lael Miller. She's one of my all time favorite romance authors. 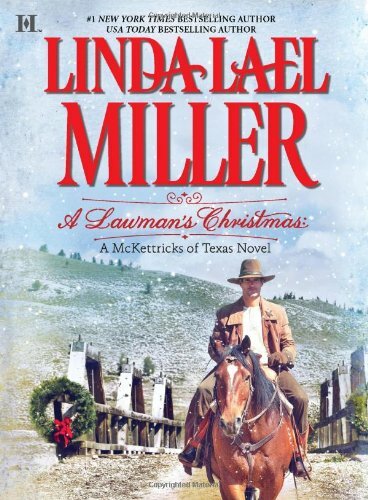 So naturally, I jumped at the chance to be part of the blog tour for A Lawman's Christmas. Here's a random confession: I did a "happy dance" when I opened up the envelope that this book came in and saw that it was in there. Good times here at The Eclectic Bookshelf. The book takes place in 1914. Right as things in Europe are REALLY starting to heat up and it's looking like there is going to be a war. Which means that Armies are going to be in desperate need of beef to feed their soldiers. Our hero Clay plans on being ready. What he doesn't plan on is Dara. See when Clay accepts the position of marshall of the town of Blue River, Texas he has a plan. One that involves a ranch, a wife and a house full of children. But there is a slight wrinkle in his plan....Dara Rose Nolan, the widow of Clay's predessor. Dara and her two small children are living in the cottage that has been promised to the new marshal as part of his pay package. If they have to leave their home they will have no where else to turn to. Dara is determined to not end up homeless and Clay is taken aback by Dara's determination and situation. Clay decides that he can stay at the jailhouse until Dara can come up with a more suitable situation. But circumstances happen which lead to a marriage of convience for Clay and Dara. But how long will it remain "convenient" considering both Clay and Dara are more than a little bit attracted to one another? Overall, I thought that this was a very good Christmas story. I was hooked from the very beginning and I really liked Dara. It had to be beyond difficult to be a woman in that time in history and I could not help but cheer for Dara. I am giving away 1 copy of A Lawman's Christmas (in an effort to clear some space on my overflowing bookcase) to 1 lucky commentor. All you have to do is leave a comment with an email address and answer this question: Do you like to read romance's where the hero is an alpha male cowboy and why? Contest ends on October 27. Thee is something rather special about cowboys. They tame the wild. I can't imagine one who was not alpha. I do like to read romance's where the hero is an alpha male cowboy. I think every girl loves a cowboy! I love alpha males probably because I love alpha males in real life. Who wants a useless computer nerd? I like capable, good, honest, hard-working strong men. Luckily I am blessed with just that in Mr. Whimsy. Great review. Thanks for the contest and Goodreads invite. i think i like an alpha male in any story, make him a cowboy, throw in some romance and that is the best book to read!